Food and beverage is a natural and vital part of any event and has a way of bringing strangers together and turning them into friends. Nearly all events feature some type of refreshment, whether it be coffee and water, a continental breakfast, afternoon tea or a full-scale dinner. The time of day – morning, noon, afternoon or evening. Duration of the event – One hour, or all day. Attendees – different groups of people may require different foods. Budget – food and beverage may not be the main component of your event, which might mean you have less to spend on it. Food service – the manner in which your food and beverage is served (buffet vs. plated, etc.) can help accomplish your event goals- think creatively! Choose a caterer that offers the best overall value for your event. To determine this, it is recommended that you get several proposals from competing caterers in order to compare and contrast what they are offering. Send a Request for Proposal (RFP) to each of the contenders so everyone is the same page and knows what you need. Some things to consider: the proposed menu items, the quality and creativity of the food and the price. When reviewing cost, pay attention to actual food cost, as well as rental and staffing costs, which can add up fast. The best overall value is not necessarily always the least expensive option, but your budget may end up dictating your choice. If you have a restricted budget, let the caterer know up front, as most are happy to work within a certain price range. Rebecca’s is the preferred University caterer, both on and off campus. If you wish to use a caterer other than Rebecca’s, the caterer must be approved in advance by the Director of Dining Services. The caterer must provide University Counsel and the Office of Risk Management with satisfactory evidence of insurance and other approved documentation. 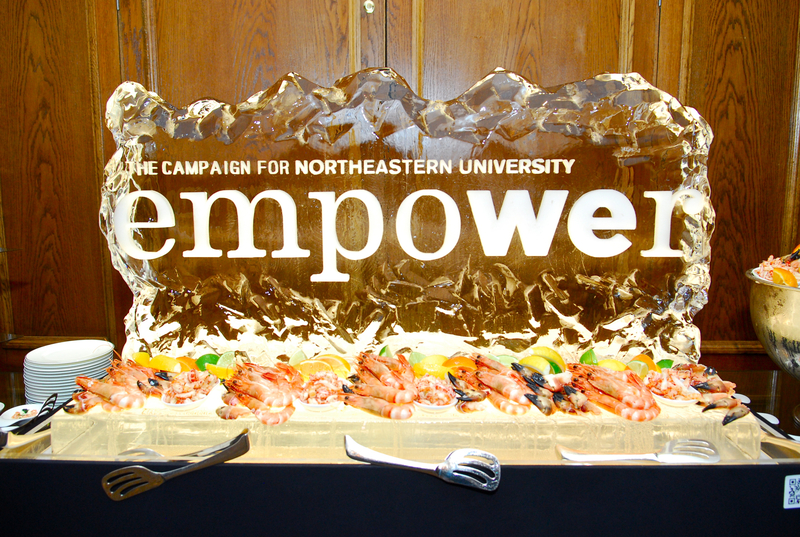 Contact the Office of University Events if you are considering an off-campus caterer. 1. There must be a written agreement between the caterer and the University. This agreement must be approved by University Counsel and the Director of Food Service at least four weeks prior to the event. 2. Caterers must provide the University with satisfactory evidence of required insurance, licenses, and permits. 3. Caterers must provide an insurance certificate proving general liability insurance coverage, naming Northeastern as an additional insured, with limits of $1,000,000 per occurrence and $2,000,000 aggregate. Exceptions to these limits may be made on a case-by-case basis by the Director of Risk Management. 4. Certificates of insurance should be delivered to the Office of Risk Management, 122 Saint Stephen Street, and to the Business Office, 480 Renaissance Park, no later than 10 business days before the event. 5. Contact the Director of Food Service for information on licenses and permits required of caterers other than Chartwells. 6. Caterers must clean up and remove all trash and equipment within two hours of the time that an event concludes, unless special arrangements are made in advance with the facility manager. In some cases, the department hosting an event may be responsible for paying a cleaning fee after an event that is catered by an off-campus caterer. Alcohol is permitted at University events and in connection with business meals, provided it is served legally and is incidental to the activity. Alcohol at University events may only be served by Chartwells TIPS-certified bartenders. The Office of Risk Management must be notified in advance by the host department. Specific conditions apply concerning locations on campus where alcohol may be served. Alcohol may only be served on campus in locations that are deemed to have controllable access. No one under 21 years of age may attend an event at which alcohol is served. If any guests under 21 are in attendance, alcohol is prohibited from being served. Generally, alcohol may not be served at an event in the Curry Student Center unless approved by the Student Center Director of Operations and the Director of Food Service. In the student center, event guest identification is required to confirm that guests are over the age of 21, and event access controls are needed so that alcoholic beverages are not carried beyond the confines of the event location. Identification plans and access control plans must be in place and approved in advance. The University may, at its discretion, require that a paid public safety detail be hired by the department at the department’s expense to control access in and out of an event at which alcohol is served. Additional access controls that may be required include ticketed admission, and presentation of a government-issued photo ID to event staff and bar servers, if requested. On a case by case basis, if Chartwells is serving alcohol at your event, you may be required to arrange and pay for costs associated with Northeastern police detail at the event. NU Public Safety will determine if a mandatory paid detail is required. Events held off campus that involve the serving of alcohol shall be required to adhere to the University Policy on such events. Insurance certification from outside venues serving alcohol must specifically include liquor liability coverage. More detailed alcohol guidelines for faculty and staff can be found here. For more information or any questions about the University’s Alcohol policies, contact the Office of Risk Management at 617.373.7167.